We are a professional fitness coaching facility in Mallow, County Cork. Our aim is to provide the most effective, enjoyable fitness experience of your life and to help you achieve the results you’ve always wanted. World class health and fitness can be achieved in a garage gym with the correct equipment and knowledge. During your CrossFit journey you will learn how to exercise effectively and safely, increasing intensity as you build strength and fitness. All our equipment has been imported from the United States and purposely built for CrossFit by Rogue Fitness- the official supplier to the CrossFit Games. At CrossFit Mallow we believe that training should prepare you for the challenges that life throws at you, the unknown and the unknowable. We do this by offering a broadly inclusive programme tailored to meet the needs of each and every individual that trains with us. This means we can help you regardless of whether you want to play professional sport or play with your kids at the weekend! We scale the programme to suit YOU! 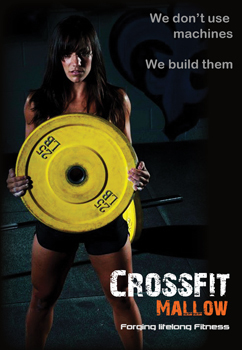 You will be trained in how to lift, jump, throw, row, run, swing and press. You will learn many new skills from all areas of fitness. Our specialty is not specializing. Our programming keeps your body guessing and constantly moving forward; becoming stronger, fitter and more flexible. We will train you like an athlete to give you the ability to excel at anything life throws at you. All our sessions are professionally coached. They are short, intense and can fit into the busiest of schedules.